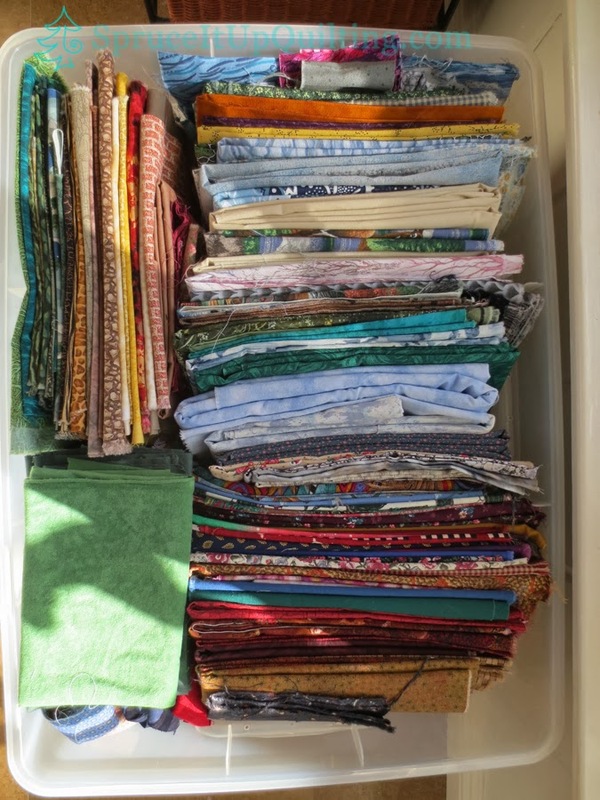 While preparing the guest room for our son and his wife's stay, it was imperative that I move the fabric stash out of the closet. 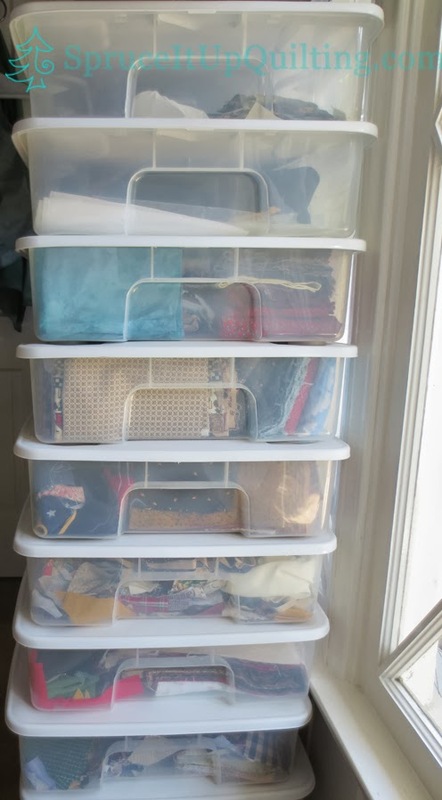 I also moved a few pieces of furniture as they will most likely bring their own computers and therefore will need a desk or a table. So with that closet clearing in mind, I moved all the storage boxes to my studio to see if I could sort the stash and make it look orderly... perhaps even empty a few of the boxes onto the shelves? 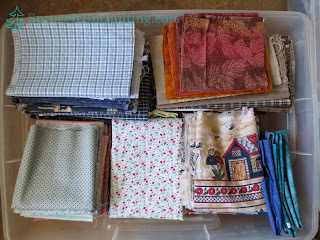 I started folding fabrics late last year after I found this tutorial by Angela Pingel. 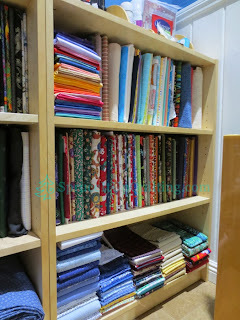 I loved how her fabrics looked on her shelves and thought what a terrific idea to keep my stash in a similar way. 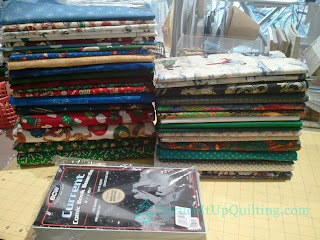 I ordered the Comic Book Boards from Amazon and as soon as they arrived I started folding! 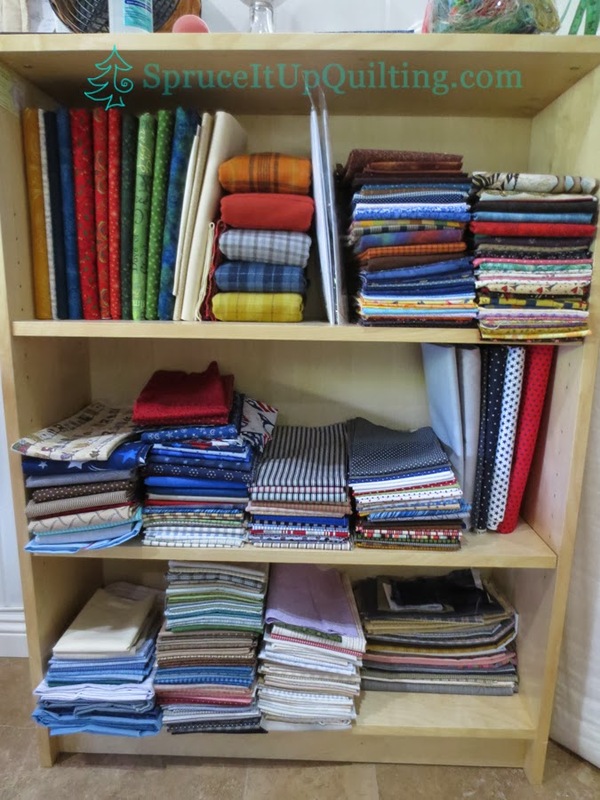 Soon I was looking for places to put the folded fabric as the one piece of furniture I really needed was a bookcase! However, at the time, there was no more room to allow another piece of furniture; the sewing studio was also my scrapbooking room! 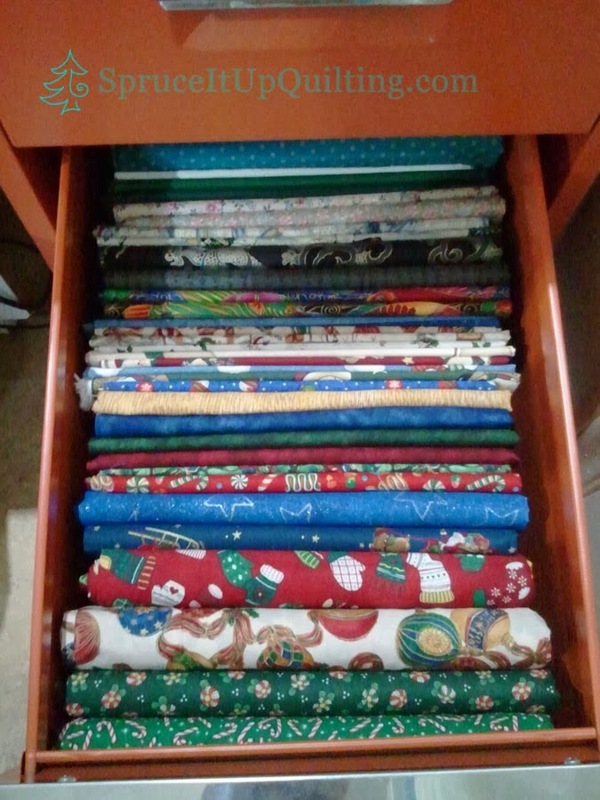 So I looked for convenient locations to store the stash... this is a file cabinet I found at my favorite thrift store. Then the folding stopped for lack of space to put the fabric. The first two bookcases sit behind Lolah against the wall and away from direct sunlight. Someday I hope to have a large enough closet or cabinet system to put all my fabric behind doors. 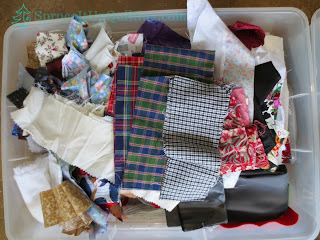 This one I've shown you before: it's my project fabric stash. I ran out of Comic Book Boards a few weeks ago so I have several large cuts of fabric that need to be re-folded once the boards arrive from Amazon. 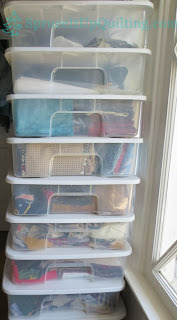 Also there's not enough room on the shelves to store all the fabric so I had to keep some in the plastic containers. 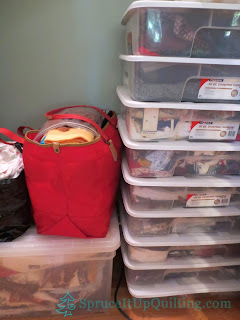 The pile of containers will remain in the studio for now. 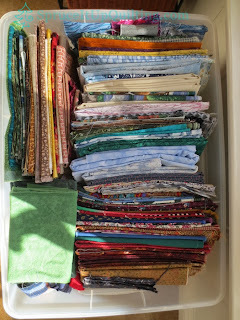 Yes they are in front of the window but I put several layers of tissue paper over the window to prevent the early morning sun from bleaching the fabrics. The boxes will return to the guest room closet as soon as son and his wife have moved to their own home. 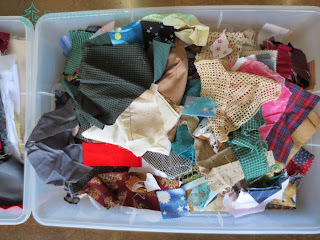 I do like how she divides her fabrics into groups/colors; I especially like what she did with her little bits of fabrics. 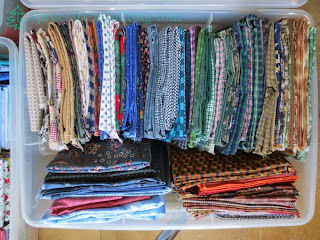 I haven't had a chance to organize my stash into such groups yet; I want to fold it all then perhaps I will divide and conquer the piles! OCD? Me? perhaps to some degree... but not as much as Teresa! 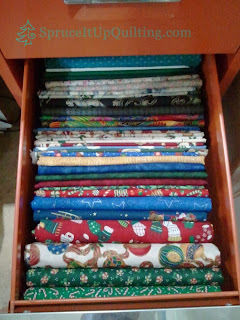 With that much invested in quilting supplies though, you have to be organized to keep things neat and accessible. Otherwise, what's the point of having all that "stuff" if you can't make it look pretty and easy to find? 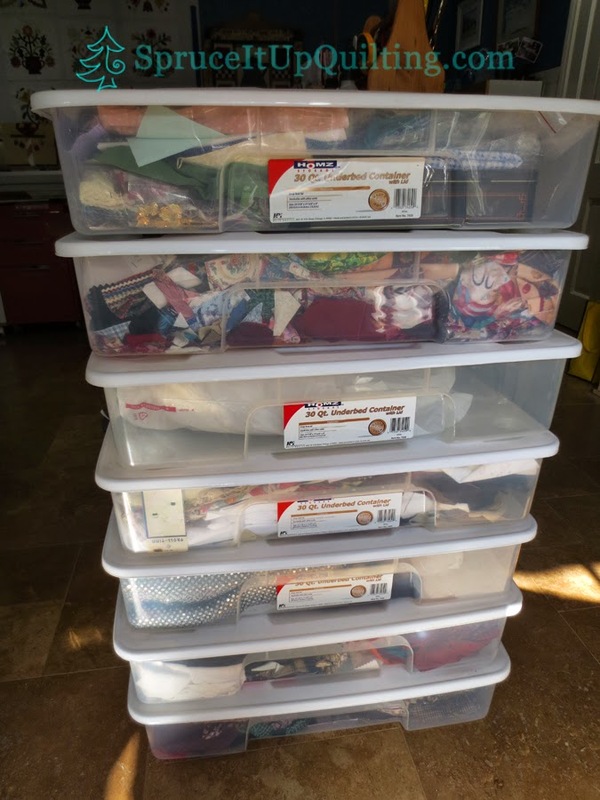 Next up... the blanket boxes! 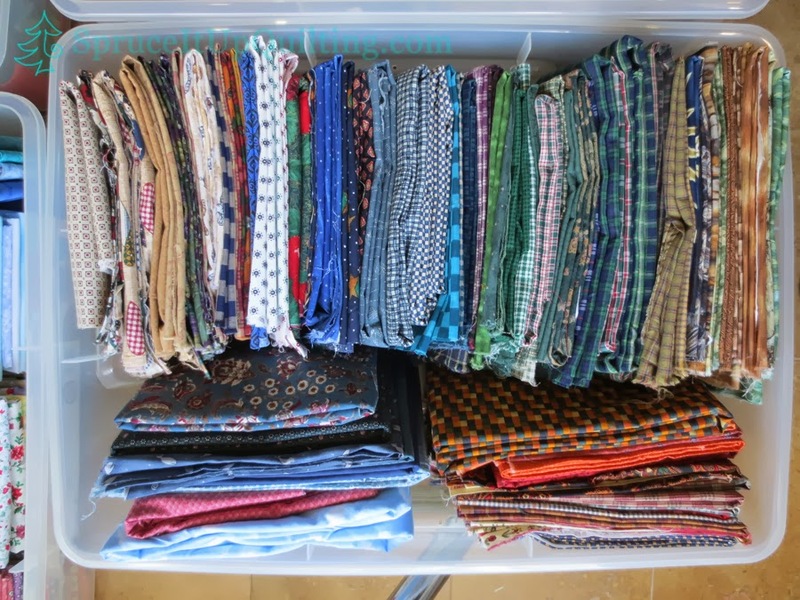 Yes... there's more to fold! 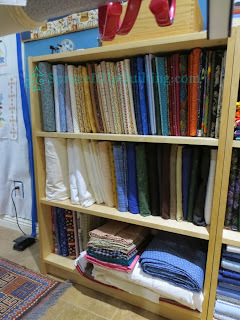 Again I am amazed at your talent for storage and keen eye of displaying your fabrics! Thank you CD-DD. 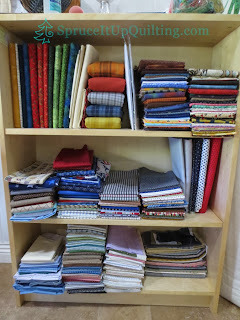 It looks better and better and with easier access to the supply, perhaps I can put it to use! That's the intention at least. You can't use what you don't know you have!